Scammers pretending to be from the ATO are always more common during tax time so be vigilant and protect your personal information. It is important to remember that the ATO do not threaten jail or arrest and do not email, call or SMS asking for credit card or bank details to issue refunds. Every year, scammers impersonating ATO (Australian Taxation Office) employees attempt to obtain personal information for financial gain from you. Generally, phone scamers demand payment for an unexpected debt or offer an unexpected refund or grant. Phone scammers are likely to be pushy or aggressive. They may tell you that there is a warrant out for your arrest or offer to send a taxi to take you to a post office so that you can make a payment. There is even a recent scam where the “Tax Office employee” wanted to be paid with I-Tunes Cards. drivers licence, Medicare and passport details. The above information is used or sold to other criminals to commit identity fraud. This can happen immediately or even months or years later. 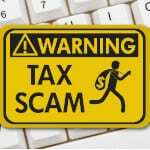 The ATO has up to date info on their website here on recent and common scams .